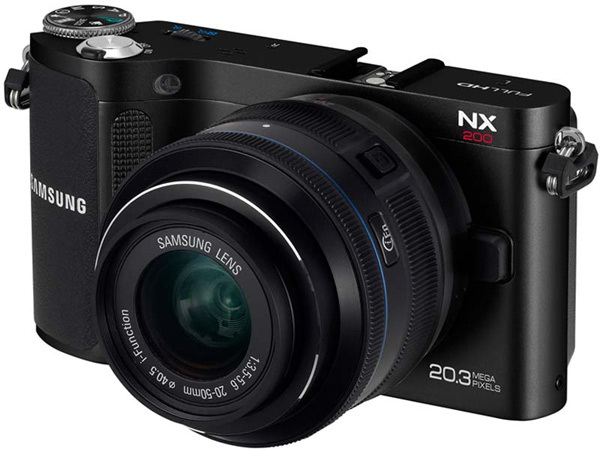 Today Samsung announced a new mirror less camera; the Samsung NX200. This new camera features a 20.3 megapixel APS-C CMOS sensor and is capable of shooting seven photos per second. It can also record full HD video. The Samsung NX200 is more compact than its predecessor, the Samsung NX100. Instead of plastic the body is now made out of a magnesium alloy. This improves the look and feel of the camera. It does not have a build in flash, but you can buy an optional flash for the hot shoe. The ISO sensitivity went way up, so you might not need a flash all that often too. The display is comparable with the NX100, but supports touch now. According to Samsung controlling the camera became more easy with the new touch screen. It looks like 20+ megapixel cameras (even on APS-C format) are the new trend. Sony announced two 24 megapixel cameras just last week. A pretty big boost compared to earlier models. I'm curious to see as to what full-frame sensor might come out later this year.. The Samsung NX200 is expected in stores in October at a retail price of 849 euro. Samsung also announced four new lenses; a 18-200mm f/3.5-6.3 ED OIS superzoom, a 16mm f/2.4 pancake, a 60mm f/2.8 macro ED OIS SSA and a 85mm f/1.4 ED SSA.